Sweden’s Holocaust hero Raoul Wallenberg, who saved tens of thousands of Hungarian Jews before mysteriously dying in a Soviet prison, was honored with the Congressional Gold Medal Wednesday at the US Capitol. 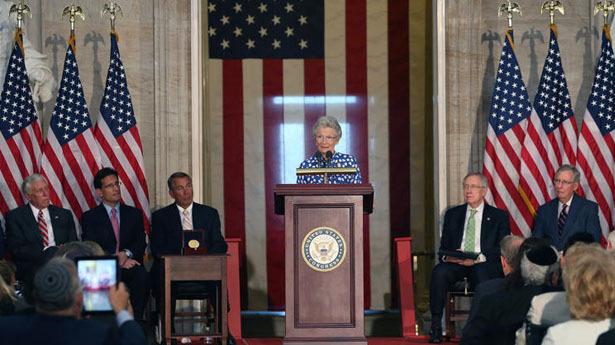 Wallenberg’s family attended the ceremony in which congressional leaders posthumously awarded the prestigious US civilian honor to one of the most important and courageous humanitarians of the World War II era. “This is a magic moment,” Wallenberg’s half-sister Nina Lagergren said during the ceremony. “That’s what we want. It can’t be difficult,” she told senior US lawmakers including House Speaker John Boehner. For decades Wallenberg’s family has pressed the Kremlin to open Russian archives that might hold clues as to where, how and why the Swedish diplomat died. Wallenberg arrived in Budapest in 1944, and within a few months he managed to save tens of thousands of Jews by providing them with Swedish passports and purchasing 32 buildings to house many of them. After the Soviets arrived in January 1945, Wallenberg was arrested. According to Russia’s government he died in a Moscow prison, but the family has expressed doubts about the Kremlin version of events. A Wallenberg niece attending the ceremony, Marie Dupuy, told AFP that the US ambassador to Sweden had mentioned to her that US President Barack Obama had spoken directly with his Russian counterpart Vladimir Putin in September about opening the archives. A senior White House official would not say whether Obama had raised the issue with Putin, but told AFP that it had been discussed at a senior level. Obama and Putin met briefly in September in St. Petersburg at the G20 summit, but did not hold formal bilateral talks. In September Obama had promised Lagergren he would convey her request to Putin. Wallenberg was made an honorary US citizen in 1981 — at the time just the second person after Britain’s Winston Churchill to receive the honor — and a bust of Wallenberg resides in a room of the US Capitol. “The key is in Moscow,” Dupuy said of the quest to find the truth.